Leinster head coach Leo Cullen remains wary of Montpellier’s array of talent eve if Aaron Cruden fell foul of injury. THE MARQUEE ATTRACTIONS of Aaron Cruden and Jonathan Sexton may have succumbed to injury, but that should not detract – well, not too much at least – from what is shaping up to be an intriguing Champions Cup Pool 3 curtain-raiser in the RDS. The point made by Leo Cullen this day last week about this being a meeting of international stars against a crop of homegrown talent still stands, although Cullen’s group has it’s fair share of international stars too. Cruden is a special talent, but Vern Cotter’s Montpellier pitch up to face Leinster in Dublin (kick-off 1pm, Sky Sports) with no shortage of controlling influence. Ruan Pienaar of course, excels in that aspect of scrum-half play. After Leinster bore witness to his big goodbye party in Belfast in May, they might have expected to enjoy a little longer before their paths crossed again. “He’s a class act,” Cullen said of the South African who enjoyed just one win at the RDS. While Vern Cotter has handed out-half duties to 19-year-old Thomas Darmon in Cruden’s absence, the experienced Springboks on either side of him will have a large role in managing the game. Frans Steyn departed early under a red card when he came to the RDS in January, so look out for how he balances the effort to remain cool this time around with determinedly making up for the game-changing high hit on Sexton. Cullen singles out Bismarck du Plessis, injured for the meetings with Leinster last term, as the man who has made the most difference in Montpellier’s excellent start to the season. However, there’s no tip-toeing around the enormous presence of Nemani Nadolo on the wing after he gave the Kearneys such a torrid time in the away fixture last seaosn. “People forget how skilled he is,” says Isa Nacewa. “I remember some unbelievably skillful tries he’s scored at Crusaders. He’s a smart player too, and people forget he’s got a great left foot. Nacewa’s recovery from a calf problem along with a dead leg for Rory O’Loughlin has brought Cullen to select a more robust looking centre partnership than the reverse scenario would have allowed. The Aucklander has never looked out of place in any position he has turned his hand to, but even after familiarising himself with the 12 jersey through pre-season operating (on a first game after injury) in that position at this level will be a fresh challenge for the experienced campaigner. The added bonus of bumping Henshaw out one position is that he can more readily get to the wide channels and level up the physical mis-match that Adam Byrne faces coming down the tracks. Even with Louis Picamoles returning to the back row, physical mis-matches won’t be so much of a problem for Cullen’s pack. It promises to be more of an evenly matched Test quality slug-fest. And that almost sums up the challenge that this pool represents. Cullen didn’t want to label Pool 3 as the pool of death. Instead, he looked at the latest facts and form available, and they add up to the same conclusion. “Glasgow being top of their conference, Exeter being second in the Premiership and Montpellier being second in the Top-14, that would stand as a reason why it is the toughest pool. “You have to battle for every single point. It is crucial: we picked up a bonus-point win here against Castres last year and we picked up a very late losing-bonus point in Montpellier. And this afternoon, a duel in which Ross Byrne is the veteran of two understudy out-halves surrounded by international talent is a sub-plot well worth investing in. 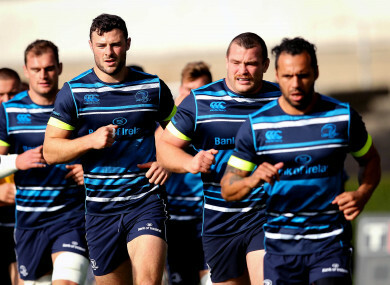 Email “Leinster ready to scrap for every point in toughest Champions Cup pool”. Feedback on “Leinster ready to scrap for every point in toughest Champions Cup pool”.